Are you looking for a WordPress theme for your wedding photography website? As a wedding photographer, you have some special needs for your website, and you’ll probably want a theme designed with wedding photographers in mind. 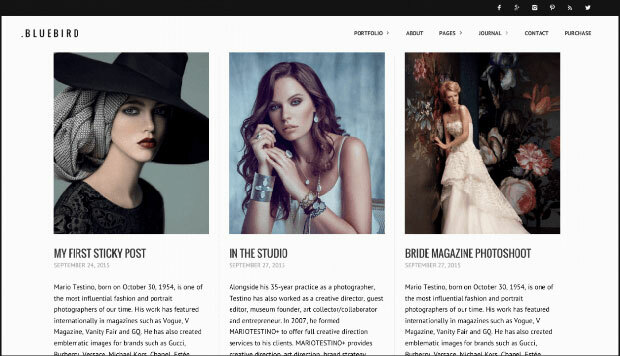 In this article, we will share 27 best wedding photography WordPress themes. There is a variety of free and premium wedding photography WordPress themes for you to choose from. In this post, we’ll cover both. 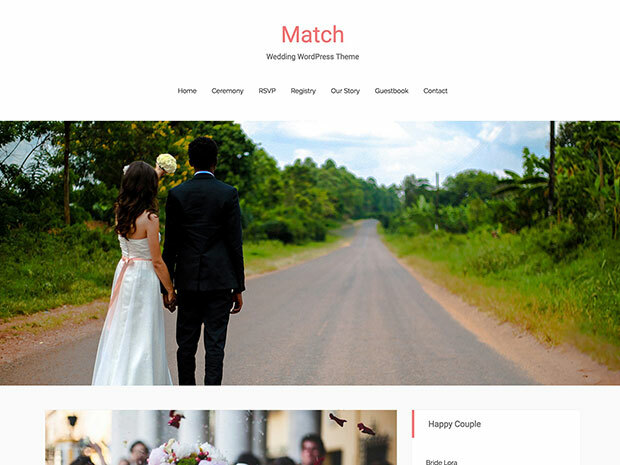 Match is a free WordPress theme for wedding photographers. It has a responsive layout, custom menus and more. 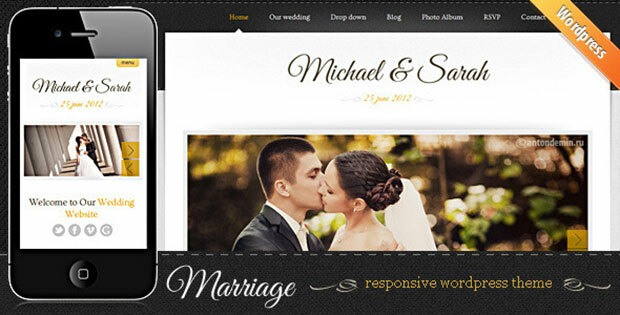 Weddings is a fully responsive WordPress theme. You can share the wedding stories of your clients using this theme. It also has the ability to add customer testimonials to attract more clients. 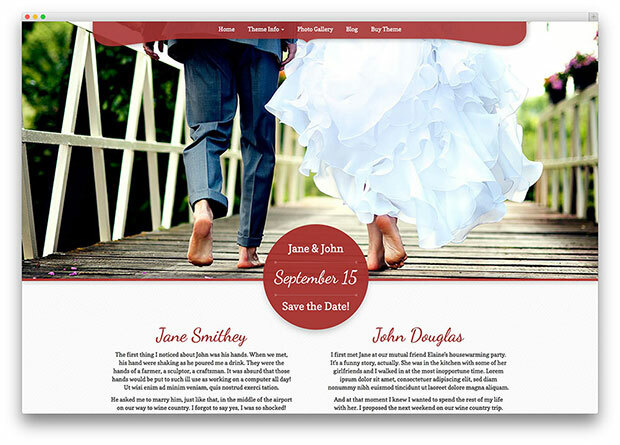 Wedding Style is a WordPress wedding photography theme. It has multiple color schemes to choose from. The theme includes a segmented homepage, the option to add a WordPress image slider, and more. 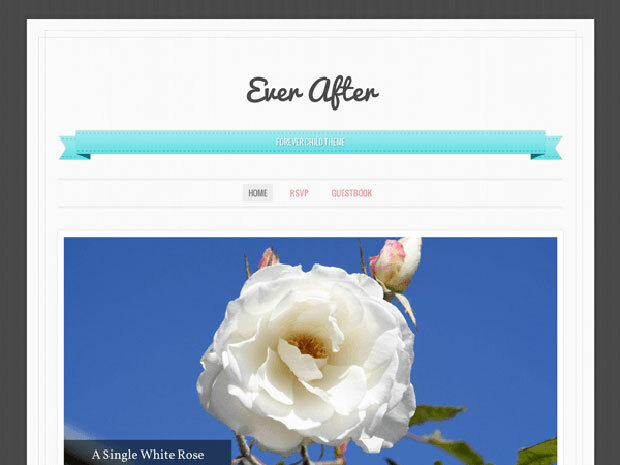 Ever After is a free wedding theme for WordPress. It has a one-column layout to display photos and videos amazingly. This theme is simple and sleek. 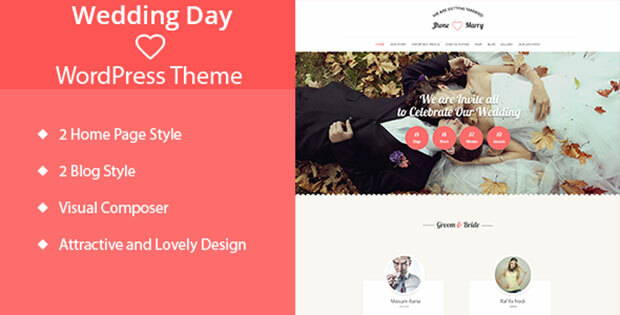 Love Birds is a charming WordPress theme for wedding photographers. It is simple and sweet. 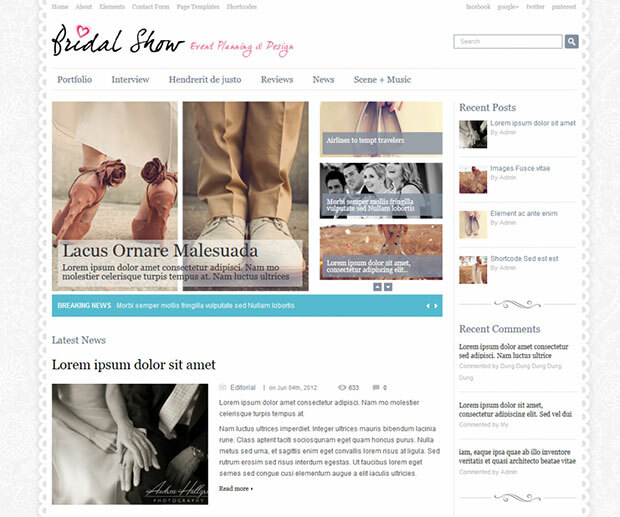 Bridalshow is a free WordPress theme for displaying your wedding photos and albums. You can add custom menus and widgets. This theme works great across all mobile devices. 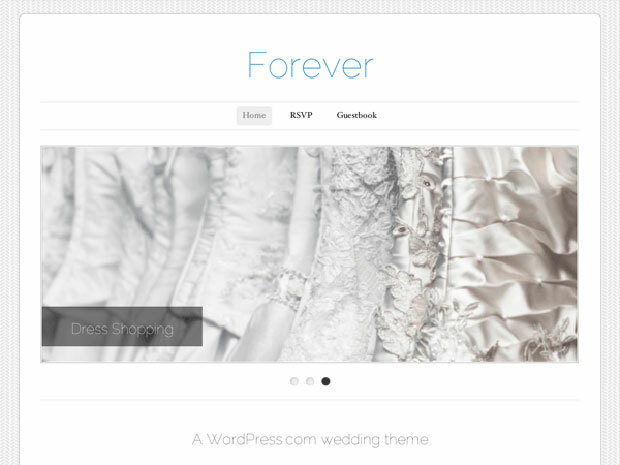 Forever is a responsive WordPress theme for wedding photographers. It comes with a simple image slider to show your featured work. June allows you to create simple photo galleries and albums. 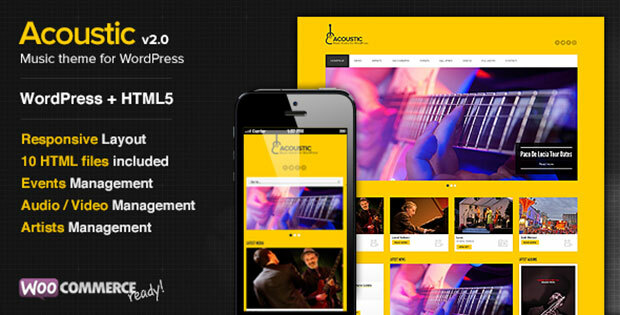 It is fully responsive and works great on all mobile devices. You can upgrade to paid license for more features. 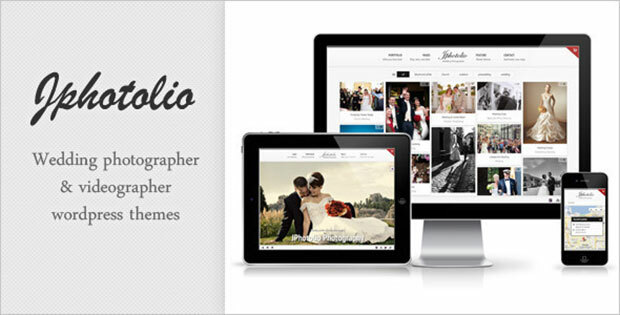 JPhotolio is a wedding photography WordPress theme that comes with tons of features to beautifully display your photos, videos, and wedding albums. It has multiple options for colors, and a user-friendly navigation that your visitors will love. You can purchase JPhotolio for $44. Real Photography is a minimal wedding theme for WordPress. It has a robust structure and powerful features. 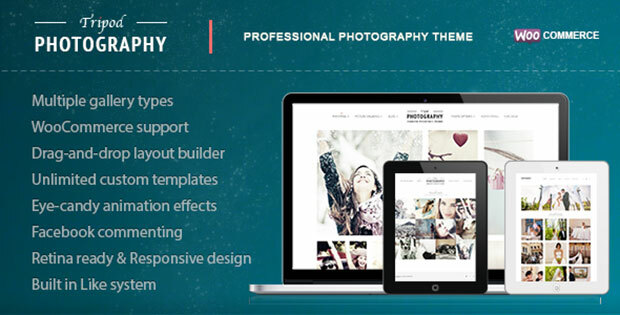 You can buy Real Photography WordPress theme for $59. Vivah is a wedding photography theme for WordPress. It is retina ready and fully responsive. Vivah also offers many different colors to choose from. You can purchase Vivah wedding theme for $49. 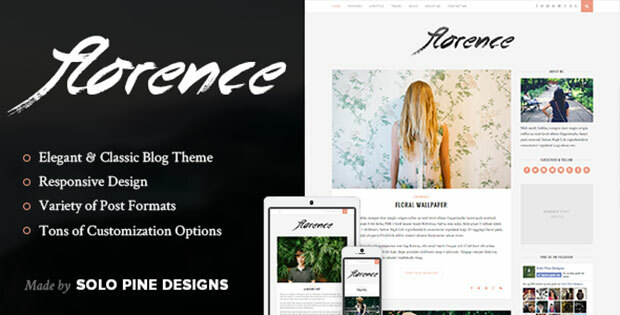 Florence is a premium WordPress theme for wedding photographers. It has tons of customization options and a variety of post formats. This theme is fully responsive and works great on all mobile devices. My Wedding is designed with your wedding photography clients in mind. If you are including a website as a part of your wedding package, this theme will allow you to create that website for your clients. This theme even includes an RSVP form that allows your client’s guests to RSVP directly from their website. You can buy a license to use My Wedding for $39. Tripod is a professional WordPress wedding photography theme. It has a drag and drop layout builder which makes building out your portfolio a lot easier. 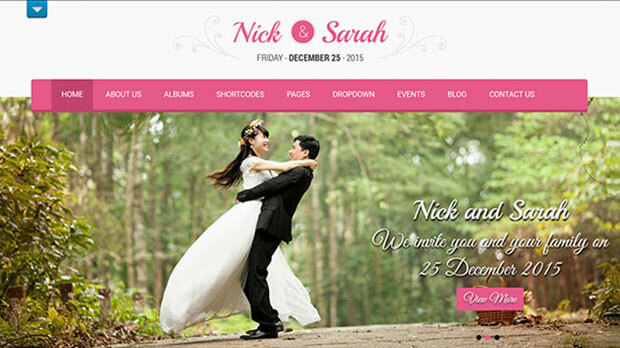 This theme also allows you to integrate WooCommerce to sell your wedding photos. You can also add password protected image galleries to show proofs to your clients. You can get Tripod for $59. Bluebird is a simple premium WordPress theme for the wedding photographers. It has features like photo proofing, masonry layout, pricing page and more. You can buy Bluebird for $49. 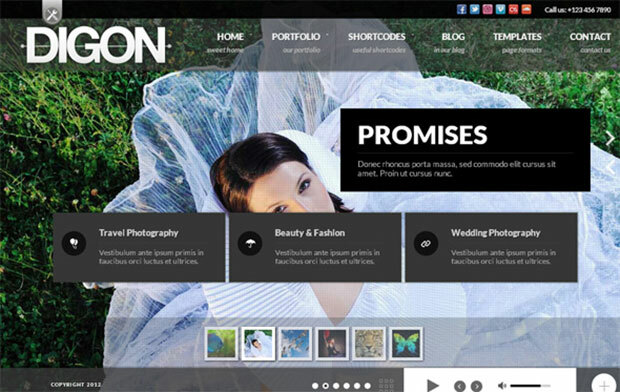 Digon is a wedding theme for photographers that allows you to display large, fullwidth images on the front page. It has 2 options for posts: fullwidth view and 2-column view. Other features include password protected portfolio, pages and more. You can also show fullscreen images on hover on the front page. Digon is a $49 investment. Marriage is a premium responsive wedding photography theme for WordPress. It has a simple and minimal design. The colors used in this theme are attractive and looks great to the wedding events. You can add custom web fonts to maximize the reach of visitors. Marriage can be purchased at $44. 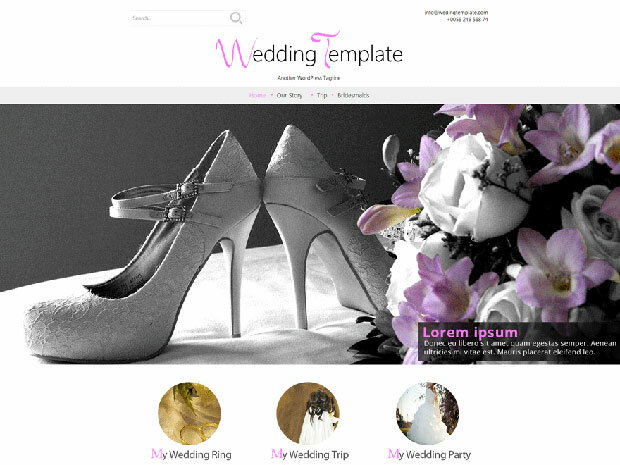 The Wedding is a personal wedding WordPress theme for your clients. 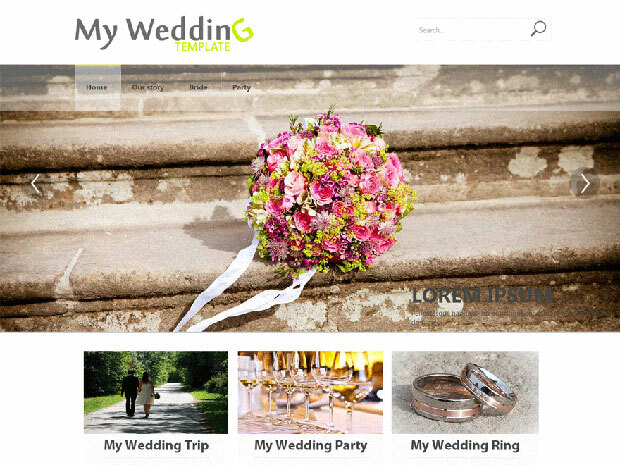 You can easily create a website for your client’s upcoming wedding with this theme. Acoustic is a WordPress photography theme with lots of skins to choose from. You can create simple yet beautiful wedding photography websites with great features using this theme. You can purchase Acoustic for $49. Teardrop is a premium fullscreen WordPress theme with lots of features. You can add a video or image slider in the background on the homepage. It also allows you to add background musics. Chocolate is a wedding WordPress theme that is full of gradients and shadows. It has many features which make it easy to customize. Chocolate can be purchased for $49. 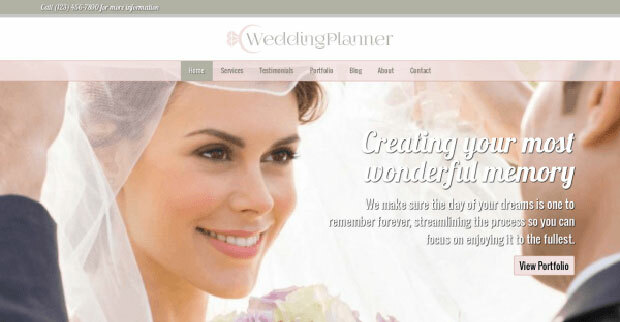 Wedding Planner is a fully responsive wedding photography theme for WordPress. 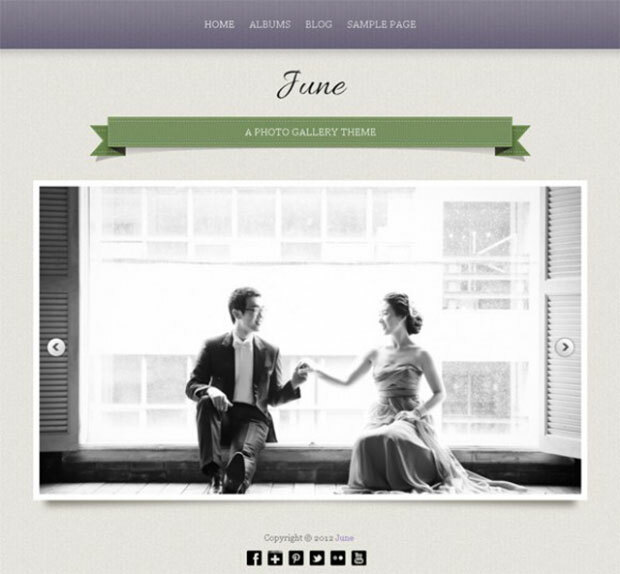 With the features included in this theme, you can create a complete wedding portfolio website. You can buy Wedding Planner for $75. Wedding Day is a simple and sleek WordPress Photography wedding theme that comes with 2 home page and 2 blog page styles. It also has a visual composer to get things done real quick. You can get Wedding Day for $49. 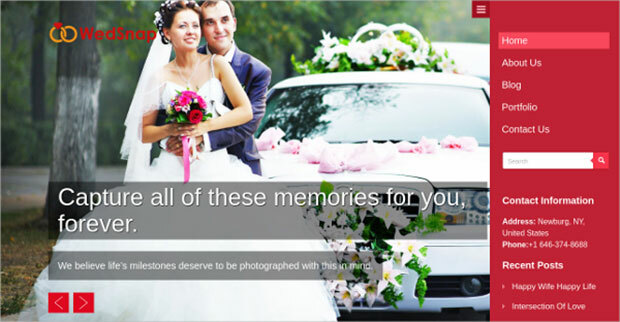 Nuptials is a responsive wedding photography WordPress theme. It has shortcodes for quick setup of your content. This theme also includes multiple color options to choose from. You can buy Nuptials for $48. Enlance is a WordPress wedding photography theme. It has the option to display a masonry view gallery. (You can also create a masonry image gallery using Envira Gallery in WordPress with any theme using Envira Gallery.) 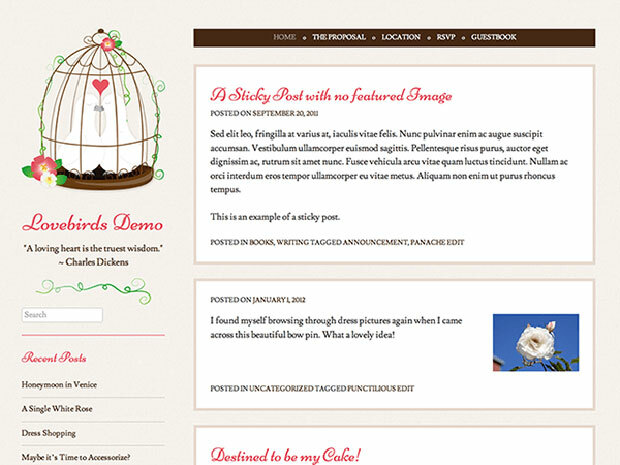 This theme is fully responsive and has multilingual support. 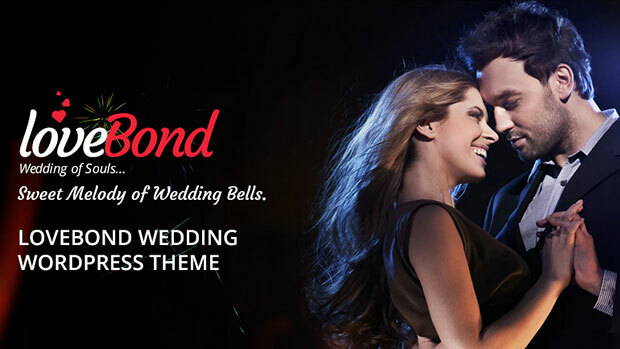 LoveBond is a professional wedding photography theme. You can add image sliders and photo galleries to display your portfolio. You can get LoveBond for $49. WedSnap is a premium WordPress wedding photography theme. It has a full-page slider on the homepage to display your featured work. This theme is fully responsive and works great on all mobile screens. You can purchase WedSnap for $79. That’s it! We hope this article has helped you to find 27 best wedding photography WordPress themes for your website. For lots of tips for creating your wedding photography website, check out or complete guide on how to create a photography website in WordPress. All photography themes are stunning. Keep sharing!! Hey Danial, I’m glad you like it. Do follow us on Facebook and Twitter for more free themes and WordPress resources. All Photography themes are very beautiful and amazing. All the wedding photography themes are very nice and amazing. And I love Nuptials theme. It’s different from other.